In Thailand too, love is celebrated every year on 14 February. There is no better opportunity than Valentine’s Day to organise a day of awareness and prevention on reproductive and sexual health. 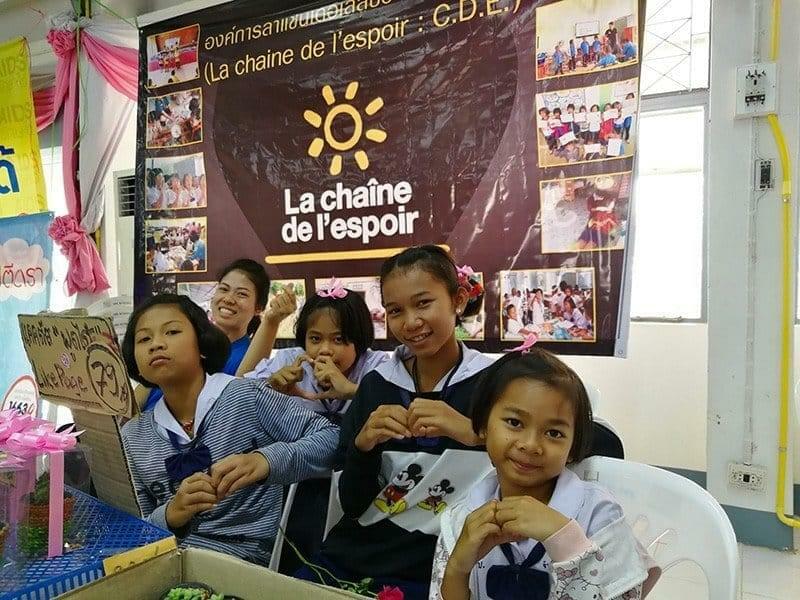 As part of its strengthened partnership with Nang Rong hospital, the local team of La Chaîne de l’Espoir has prepared a major event intended for the 2,700 children of Nang Rong Technical College! This higher education school opened to young people aged 15 to 21 is particularly concerned with issues related to sexual health and unwanted teen pregnancies. La Chaîne de l’Espoir has decided to focus on reproductive and sexual health as part of its school health activity. In 2018, health centre professionals, teachers and pupils will be trained and education sessions will be conducted in all the secondary schools in our areas of intervention. On a completely different topic, the school director has also drawn our attention to the children’s very low level in English. It is the only school with no teacher specialised in the teaching of the English language! La Chaîne de l’Espoir has taken advantage of this event to present an innovative programme to learn English using phonetics. The children of Ban Nong Bua primary school have been privileged and proud to share with their elders the knowledge acquired and practised within the framework of the children’s clubs. This project, which has already been successfully tested in 14 primary schools, will be extended to all our partner schools in 2018. It will, once again, place the child at the centre of activities. The local team of La Chaîne de l’Espoir and all the children benefiting from our projects join us to wish you all a happy Valentine’s Day! Journée de prévention sur la thématique de la santé sexuelle et reproductive.